A detailed account an analysis of the struggle of thousands of Tekel workers in Turkey against mass closures, who have been on strike for weeks and have now occupied the headquarters of the country's main union confederation. On December 14th 2009, thousands of workers of Tekel enterprises from dozens of cities in Turkey left their homes and families in order to travel to Ankara. The workers of Tekel took this journey with the aim of struggling against the horrible conditions forced upon them by the capitalist order. This honorable struggle of the Tekel workers which has been going on for more than a month now, carried the idea of a strike in which all workers would participate. By doing so, the workers of Tekel started leading and carrying forward the working class movement in the whole country. What we will try to give the account of here is the story of what happened so far in the Tekel struggle. It should not be forgotten that what this account concerns not just the Tekel workers, but the workers of the whole world. We owe our warm thanks to the Tekel workers for making the writing of this article possible by pushing the struggles of our class forward, by their determined struggle and by explaining to us what they went through, their experiences and thoughts. We think that firstly it would be in order to explain what caused the workers of Tekel to launch this struggle. The Tekel workers are struggling against the 4-C policy of the Turkish state. The state has been employing tens of thousands of workers other than the Tekel workers under the 4-C conditions. These conditions are what is coming to tens of thousands of workers soon, the sugar factory workers being among the first future victims. Besides, lots of sectors of the working class have been experiencing similar attacks under different names, and such attacks are waiting for those who haven't been hit by them yet. What is this 4-C then? This practice was actually a ‘blessing' put forward by the Turkish state when the number of workers who were to lose their jobs due to privitations increased. It includes, aside from a serious pay-cut, public workers being shifted to different sectors within the state under horrible conditions. The worst of the conditions introduced by the 4-C policy is that it gives the bosses of the state an absolute power over the workers. Thus, the wage, which is determined by the state and is already a massive pay-cut for the workers, is merely a maximum price. It can be reduced by the state enterprise managers arbitrarily. Also, working hours are completely abolished for those who are to work under the 4-C conditions and the bosses of the state enterprises gain the right to arbitrarily make the workers stay at work for as long as they want, until the workers "finish the task assigned to them". The workers get no money whatsoever in return for this "extra" work after regular public employees' working hours or during holidays. Under this policy, the bosses have the power to fire the workers arbitrarily, without being obliged to pay them any compensation. Besides, the period workers can work in a year is between three months and ten months, nothing being paid to the workers in the months they aren't asked to work and the duration of their work again being arbitrarily determined by the bosses. Despite this, the workers are forbidden to find a second job even if they are not working at a certain period. The social security payments of the workers are not made anymore under the 4-C policy, and all health benefits are taken away. The privatisations, just like the 4-C policy started long before. In the Tekel enterprises, initially the cigarette and alchohol departments were privatised, and then the process led to the leaf tobacco factories being closed. We are of the opinion that today, it is clear that the problem here is not just the privatisations. We think it is obvious that the private capital which is taking the workers' jobs, and the state, that is the state capital, wanting to exploit the workers by condemning them to the most unimaginable conditions are jointly making the attack. In this sense we can say the fight of the Tekel workers is born out of the class interests of all workers and represents a struggle against the capitalist order as a whole. We think it would also be in order to explain the situation of the working class movement in Turkey around the period the Tekel workers launched their struggle. On 25th November 2009, a one day strike organized by KESK, DISK and Kamu-Sen had taken place. As we said, the Tekel workers took the journey to Ankara on 14th December, several weeks after this one day strike. The same week that the Tekel workers came to Ankara, two other workers' struggles took place. The first one was the demonstrations by firemen who were to lose their jobs at the beginning of 2010, and the second was the one day strike by railway workers in protest at the firing of some of their workmates for their participation in the strike on the 25th November. The riot police, seeing that class struggles were on the rise, brutally attacked the firemen and the railway workers. The Tekel workers were not treated any differently either. Besides, the number of railway workers who lost their jobs for participating in the strikes rose to nearly fifty. Lots of workers were taken into custody. It was to take some time for the firemen to recover from these attacks. As for the railway workers, unfortunately they haven't managed to make a come back to the terrain of class struggle so far. What put the workers of Tekel in the vanguard by the end of the week which started with December 14th was the fact that they managed to stand up against the repressive measures of the state, and that they kept their struggle going and alive. So how did the Tekel struggle begin? There already was a considerable minority who wanted to struggle, yet what was to trigger the struggle took place on 5th December, in an opening ceremony attended by prime minister Tayyip Erdoğan. The Tekel workers, with their families, went up unexpectedly against Erdoğan in this ceremony in order to ask what was going to happen to them. They interrupted Erdoğan's speach saying "The workers of Tekel are waiting for you to give the good news". In reply Erdoğan said: "Unfortunately elements such as these have been appearing in Turkey so far. Such elements want to make money without doing any work, by laying down. We closed the era of making money by laying down (...) They have said the property of the state is a sea and who doesn't eat it are pigs. This was how they looked at this issue. This is not how we look at it. Here is your seniority compensation. If you want we can use you under 4-C, if not go and set up your own business if you are going to. We said this too. We had an agreement with their trade-union. I talked to them, I told them ‘You have this much time. Do what is necessary'. Although we had an agreement, well there the process came to the end and one or two years passed. These are still here saying things like we want to keep our jobs and continue the same way, we want to retain the same rights in other places. No, we talked about these things. Ten thousand Tekel workers cost us forty trillion a month." Erdoğan had no idea what kind of trouble he had just gotten himself into. The workers, most of whom had supported the government previously, were now angry. How to launch a struggle was discussed by the workers in the workplaces. A workers from Adıyaman explains the process like this in an article he wrote, published in a leftist daily: "That process stimulated the workers fellows who haven't been participating in the struggle which was tried to be waged, as small as it was. They started seeing the real face of the Justice and Development Party because of these words the prime minister spoke. The first thing they did was resign their party membership. In the discussions that started in our workplaces, we decided to protect our labor all together" . The trade-union which Erdoğan had said that he agreed with, and which had not taken any serious actions in the process called for a gathering in Ankara. As a result the workers took the roads, travelling to the capital. The forces of the state staged a sneaky attack against the workers from the start. The riot police stopped the buses carrying workers, and declared that they weren't going to let the workers from the Kurdish cities where Tekel factories are concentrated, but that the workers from the Western, Mediterranean, Central Anatolian and Black Sea regions could pass. This aimed at pitting the Kurdish workers and the other workers against each other, and thus dividing the class movement on ethnic lines. This sneaky attack in reality tore down two masks of the state: that of unity and harmony and that of the Kurdish reform. Yet the workers of Tekel did not fall into this police trap. With the workers from Tokat leading them, the workers from outside the Kurdish cities protested against this position of the police, and insisted with determination on all workers entering the city together and no one being left behind. The riot police, unable to calculate the stance the government was to take, ended up having to allow the workers to enter the city all together. This incident made workers coming from different cities, regions and ethnic backgrounds form deep bonds on class terrain. Following this incident the workers from the Western, Mediterranean, Central Anatolian and Black Sea regions were to express that the strength and inspiration they took from the resistance, determination and consciousness of the Kurdish workers was to contribute greatly to their participation in the struggle and that they learnt much from those workers. The workers of Tekel had won their first victory upon entering the city. On December 15th, the Tekel workers started their protest demonstration in front of the national headquarters of the Justice and Development Party in Ankara. A Tekel worker who came to Ankara that day explains what happened like this: "We marched to the national headquarters of the Justice and Development Party. We lit a fire at night and waited in front of the building until 10 PM. When it got too cold, we went to the Atatürk Gym. There were five thousand of us. We took out our carpets and cardboards and spent the night there. In the morning, the police pushed us to Abdi İpekçi Park and encircled us. Some of our mates marched to the Justice and Development Party headquarters again. When we were waiting in the park, we wanted to go and meet up with our mates, and those waiting in front of the Justice and Development Party headquarters wanted to come to us: the police attacked with tear gas. Then at 7 PM we managed to meet up with out mates in the park. We had walked for four hours. We spent the night in the park, in the rain." On the other hand, the most brutal attack by the police took place on December 17th. The riot police, obviously acting on orders and perhaps in order to make up for not being able to prevent the Kurdish workers from entering the city when they first arrived, attacked the workers in the park with great violence and hatred. The aim was to disperse the workers. Yet this time also there was something which the forces of the state had failed to calculate: the workers capacity for self-organization. The workers, dispersed by the police, managed to organize themselves without the help of any bureaucrat and met up in a massive demonstration in front of the Türk-İş headquarters in the afternoon. On the same day, the workers, having nowhere to stay, occupied two floors of the Türk-İş building. On the days following December 17th, the demonstrations of the Tekel workers were to take place on the small street in front of the Türk-İş headquarters, at the center of Ankara. The struggle between the workers of Tekel and the Türk-İş administration marked the days following this date until the New Year. Actually, even at the beginning of the struggle, the workers did not trust the trade-union bureaucrats. They had been sending two workers from all cities with the trade-unionists to all the negotiations. The purpose of this was for all the workers to be informed of what really was happening. Both Tek Gıda-İş and Türk-İş, and the government expected Tekel workers to give up in a few days in the face of the freezing cold Ankara winter, police repression and material difficulties. The doors of the Türk-İş building were, unsurprisingly, locked up in a very short time to prevent the workers from entering the building. Against this, the workers started a struggle in order to be allowed to use the toilets in the building and for the woman workers to be able to rest in the building and this struggle resulted in a victory for the workers. The workers had no intention of going back. A serious support by the Ankara working class and above all students from proletarian backgrounds was given to Tekel workers with regards to the material difficulities of finding places to stay: perhaps a small but nevertheless important part of the Ankara working class mobilized to host Tekel workers in their homes. Rather than giving up and going back, the Tekel workers gathered every day on the small street in front of the Türk-İş building, and started discussing how to make their struggle go forward. It did not take long for the workers to realize that the only solution to get over their isolation was for their struggle to extend to the rest of the working class. In this context, militant workers from all cities who saw that Tek Gıda-İş and Türk-İş weren't going to do anything for them tried to establish a strike committee, with the foremost purpose of transmitting their demands to the trade-union. Among these demands were the setting up of a strike tent and the New Year being celebrated by workers collectively, with a demonstration in front of the Türk-İş building. The trade-union executives opposed this initiative taken by the workers. After all, what need was there for the trade-union if the workers were going to go ahead and take the control of their struggle into their own hands! This attitude had a veiled threat behind it: the workers who were already isolated feared the possibility of being left all alone if the trade-union withdrew its support. Thus the strike committee was abolished. Yet the will of the workers to take the control of their struggle into their own hands was to retain its existence. Quickly, the workers launched efforts to form bonds with the sugar factory workers who are to face the same 4-C conditions soon, and they went to the workers neighbourhoods and universities they were invited to and explained their struggle. In the meanwhile, the workers were continuing their struggle with the Türk-İş administration which was not behind the workers in any way. The day the Türk-İş board of executives met, the workers forced the doors of the trade-union headquarters. The riot police mobilized to protect Mustafa Kumlu, the chairman of Türk-İş from the workers. Workers started shouting slogans like "We will sell out who sells us out", "Türk-İş to duty, to the general strike", "Kumlu, resign". Kumlu dared not face the workers until he had announced a series of actions, including strikes which were to happen every week, starting from a one hour strike and doubling in period every week and a demonstration in front of the Türk-İş building to take place every week. He was afraid for his life. Even after Kumlu's declaration of a series of actions though, workers still did not trust Türk-İş. When a Tekel worker from Diyarbakır declared in an interview he gave that "We won't follow any decision taken by the trade-union administration to end the struggle and go back. And if a decision to end the struggle without there being a gain made as they did last year, we are thinking of emptying the Türk-İş building and then burning it down", he expressed the feelings of lots of other Tekel workers. Türk-İş backed down from its action plan when the first one hour strike had a participation rate of 30% of all trade-unions. Türk-İş executives were as terrified of the generalization of the struggle of the Tekel workers as the government was. Following the cheerful New Year's demonstration in front of the Türk-İş headquarters, a closed vote was taken among the workers in order to decide whether to go on or return home. 99% of the workers voted to continue with the struggle. Meanwhile, a new action plan, suggested by the trade-union, started being discussed: following January 15th, there was to be a three day sit-in, followed by a three-day hunger strike and then a three day death fast. A demonstration with massive participation was also to take place, as the Türk-İş administration promised. The workers initially thought that a hunger strike would be a good idea. Already being isolated, they did not want to be forgotten and ignored and they thought a hunger strike could avoid this. Also, they were feeling that they were stuck in front of Türk-İş and felt the need to go on action somehow. A hunger-strike could have acted as an intimidation for Türk-İş also. One of the most significant texts written by the Tekel workers appeared in those days: a letter written by a Tekel worker to the sugar factory workers. The Tekel worker from the city of Batman wrote the following: "Our hardworking and honorable sugar factory worker brothers and sisters, Today, the honorable struggle that Tekel workers have undertaken is a historical chance for those whose rights are being taken away. In order not to miss this chance, your participation in our honorable struggle would make us happier and stronger. My friends, I would like especially to indicate that for the time being trade-unionists would promise hope you that ‘we will take care of this affair'. However, as we have passed through the same process, we know well that they are well-to-do people and have no life-death concern. On the contrary, you are the ones whose rights would be grabbed and whose right to work would be taken from you. If you are not to take part in the struggle today, tomorrow would be too late for you. All in all, this struggle will be victorious whether or not you are in it and we have no doubt or mistrust in ourselves to take care of this. Because we are sure that if the workers become united and act as a body, there remains nothing that they cannot succeed in. With these feelings, I salute you with my deepest intimacy and respect in the name of all workers of Tekel." This letter not only called on the sugar workers themselves to join the struggle by themselves; it also expressed what had happened in Tekel with all its clarity. At the same time, it expressed the consciousness shared by many Tekel workers that they were struggling not just for themselves but for the entire working class. On January 15th, the Tekel workers came to Ankara to participate in the sit-in we previously mentioned. Now there were nearly ten thousand Tekel workers in the Sakarya Square. Some of their families had came with them. The workers had take sick-days and holidays to come to Ankara and most of them had to go back several times to renew their holiday permits. Now, nearly all Tekel workers were together. A demonstration with a wide participation was planned for January 16th, Saturday. The forces of order feared this demonstration since it could provide ground for the generalization and massive expansion of the struggle. The possibility of workers who arrived on Saturday for the demonstration spending the night and all day Sunday with the Tekel workers could result in strong and massive bonds being formed between the arriving workers and the Tekel workers. Thus the forces of order insisted on moving the demonstration to Sunday, and Türk-İş, with a typical manoeuvre, further weakened the demonstration by preventing the workers from Kurdish cities coming. It was also calculated that spending two nights in the icy Ankara winter, staging a sit-in in the streets would break the resistance and strength of the Tekel workers. It would turn out on the demonstration which took place on January 17th that this calculation was a serious mistake. The demonstration on January 17th started calmly. The workers who gathered in Ankara and several political groups started marching from the Ankara Train Station at 10am into Sıhhiye Square. In the demonstration, attended by tens of thousands of workers, first a worker from Tekel, then a firemen and a sugar factory worker spoke from the platform. The explosion took place afterwards. After the workers, Mustafa Kumlu, the chairman of Türk-İş took the stage. Kumlu, who neither cared about the struggle nor about the living conditions of the Tekel workers to spread nor about its spread made a completely moderate, conciliatory and empty speech. Türk-İş had made a particular effort to keep the workers away from the platform and had placed the metal workers who were completely unaware of what was going on in front of it. Nevertheless, the Tekel workers, asking the metal workers to let them pass, managed to come right in front of the platform. During Kumlu's speech, the Tekel workers did their best to interrupt him with their slogans. The last offence that did the trick for the workers was the announcement that following Kumlu's speech, Alişan, a pop singer who has no relation whatsoever to the working class movement, was going to give a concert in the demonstration area. The workers occupied the platform, started shouting their own slogans and despite the fact that the trade-union executives turned the sound system down, they workers who came to the demonstration managed to join these slogans. For a while, the trade-union completely lost control. Only the workers had it. Trade-union executives, rushing to the stage, started giving radical speeches on the one hand and trying to get the workers to leave the platform. When this didn't work, they tried to provoke the workers against each other and against the students and workers who came to support them. The trade-unionists tried to pit the workers who have been present in Ankara from the beginning of the struggle against those who arrived recently, and they tried to target those who came to offer their support. In the end the trade-union executives managed to make the workers who occupied the stage go down, and convinced the workers to rapidly return to the street in front of the Türk-İş building. The fact that speeches regarding hunger strikes and death fasts being put forward in order to play down the slogans about the general strike was, in our opinion, interesting. In any case, returning to the Türk-İş building was not enough to extinguish the workers' anger. Slogans such as "General strike, general resistance", "Türk-İş don't test our patience" and "We will sell out who sells us out" were being shouted in front of the union building now. A few hours later, a group of workers numbering around 150 managed to break the bureaucratic barricade in front of the Türk-İş doors and occupied the building. Tekel workers who were searching for Mustafa Kumlu in the building started shouting "Enemy of workers, servant of the AKP" when they reached the door of Kumlu's room. Following the demonstration on January 17th, efforts to launch another strike committee began among the workers. This committee was to be made up of workers who didn't think a hunger strike was a suitable way to go forward for the struggle and that the only way forward was to extent the struggle. The effort to form it was known by all workers and supported by an overwhelming majority. As for those who didn't support it, they weren't speaking against it either. Among the things seen as the tasks of the committee, other than transmitting their demands to the trade-union, was realizing communication and self-organization among the workers. Like the previous strike-committee, this committee also was made up entirely of the workers and was completely independent from the trade-union. The same determination of self-organization made it possible for hundreds of Tekel workers to join the demonstration of the health sector employees who went on a one day strike on January 19th. On the same day, while only a hundred workers were allowed to participate in the three-day hunger strike, three thousand workers joined them, despite the fact that the general feeling among the workers now is that it is not the appropriate way for the struggle to go forward. The reason behind this was that these workers did not want to leave their mates going on the hunger strike alone, that they wanted to engage in solidarity with them, that they wanted to share what their friends were to go through. Although the Tekel workers have been having regular meetings among themselves according to the cities they came from, so far a mass meeting with all the workers participating hasn't been possible. This being said, since December 17th, the street in front of the Türk-İş building had the character of an informal but regular mass assembly. Sakarya Square these days is full of hundreds of workers from different cities, discussing how to push the struggle forward, how to expand it, what to do. Another important characteristic of the struggle was how the workers from different ethnic backgrounds managed to unite against the capitalist order despite all the provocations of the regime. The slogan "Kurdish and Turkish workers together", shouted since the first days of the struggle, expresses this very clearly. In the Tekel struggle, lots of workers from the Black Sea region danced to Şemame, and lots of Kurdish workers made the Horon dance for the first time in their lives. Another point where the approach of the Tekel workers has been very significant is the importance they have been giving to extending the struggle and workers' solidarity, and this is not based on a narrow national perspective but on one which includes the mutual support and solidarity of the workers of the whole world. Also the Tekel workers managed to prevent the parts of the ruling class in opposition to use the struggle for their own purposes and do not trust opposition parties either. They are aware of how the Republican People's Party attacked the workers who were fired from Kent AŞ, how the Nationalist Movement Party has its share in shaping state policies and how it is anti-working class. A worker expresses this consciousness very clearly in an interview he gave: "We understood what all of them are. Men who voted for the privatisation law are today telling us about how they understand our situation. Until now, I always voted for the Nationalist Movement Party. I met revolutionaries only with this struggle. I am in this struggle because I am a worker. Revolutionaries are always with us. The Nationalist Movement Party and the Republican People's Party make five minute speeches here and then they leave. There were those among us who cheered for them when we first came here. Now, there is no such situation." The most striking example of this consciousness was how the workers of Tekel prevented the speakers from the fascist Alperen Organization, the same one which attacked Kent AŞ workers who were demonstrating in the Abdi İpekçi Park because they were Kurds. The Tekel struggle also made a great contribution to the firemen who were brutally attacked after their first demonstration by giving them morale which enabled them to return to the struggle. Generally, Tekel workers have given hope not only to the firemen but to all sectors of the working class in Turkey who want to struggle. 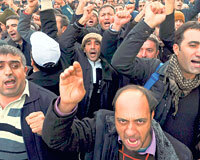 The Tekel workers have managed to put a strike in which all workers will participate on the agenda. This is why today the Tekel workers are proudly standing at the vanguard of the working class in Turkey, and are carrying our class which has been in slumber for years into joining with the struggles of the workers of the whole world. This is why they are holding the seeds of the mass strike which, from Egypt to Greece, from Bangladesh to Spain, from England to China has been shaking the world for the last few years. This honorable struggle is still ongoing, and we think that it is not yet the time to draw its lessons. With the idea of a hunger strike and a death strike being pushed forward on the one hand and the idea of a strike committee made up of workers who don't find the idea of a hunger strike fit for the struggle and want to extent the struggle; with Türk-İş bureaucrats who are nothing but a part of the state on one hand and workers who want a general strike on the other, it is hard to predict what lays ahead for the struggle, where it will go, what its results will be. This being said, we have to stress that no matter what the outcome of the struggle is, the honorable stance of the Tekel workers will bear very important results and leave priceless lessons for the whole working class. Tekel used to be the state monopoly company consisting of all tobacco and alcohol producing enterprises. Leftist Public Workers Unions Confederation, Revolutionary Workers Unions Confederation and the major Public Employees Unions Confederation, known for its fascist symphaties. A city in Turkish Kurdistan. Confederation of Turkish Trade-Unions, the oldest and largest trade-union confederation in Turkey which has quite an infamous history, having been formed under the influence of the US in the 50ies, modelled after the AFL-CIO and has been sabotaging workers' struggles since. Şemamme is a very famous Kurdish dance, and Horon is a very famous dance from the Black Sea region of Turkey. The Kemalist, secularist, left-nationalist party, member of the Socialist International, extremely chauvinistic. Municipality workers from İzmir, a metropole at the coast of the Aegean sea. These workers were fired by the Republican People's Party who controlled the municipality they worked for and then brutally attacked by the police while protesting the Party's leader. "If the Unions are on our side why are there 15,000 riot police between us and them?" First of all I should say that this is a very good article, clearing some points about the strike. 1- you are perfectly reflecting the actual situation of the "24 hours general workers assembly". Although workers are living on the streets for 24 hours, that also enabled an enourmous interaction among workers in general. It is for sure that this is the expression of the dynamism of the working class in general. However you are also talking about a strike commitee. I wonder whether this is a permanent body? Does it only includes tekel workers? Did this made any declarations openly criticizing union? 2- As far as I understand you are not critizing the general strike slogan at least as the way you did in your first leaflet. Or are you? Did your position changed? If so why? Mikhail - although you posed theses questions to me on the other thread it's difficult for me to give an answer the more detailed questions about the strike committee etc and will have to leave it to the comrades in Ankara. But on a more general point: having read your translation of the comrades' first leaflet, there is not so much in it about the mass strike except to see what's going on in Turkey as a germ of a future mass strike. As I understand it, you were criticising the leaflet (or its title perhaps) for advocating 'mass strike' instead of the more realistic 'extension of the struggle'. But as far as I can see the leaflet is talking precisely about the extension of the struggle rather than abstractly calling for a mass strike now. But it may be that I have not understood your criticism very well. What do you think about the 3rd point? The union confederations decided that they will determine the date of "general strike" in the 26th. Government gave the signals of retreat etc. So the time is too crucial right now. TEKEL is obviously a fresh start and I am aware that voluntarism is not useful. However if there is a chance for a further extension of solidarity how can it be used? The most strongest aspect of TEKEL was it being practically a 24 hours open workers assembly in the center of the capital. This created the strength of the solidarity spirit. How can this spirit be extended? What can be the role of revolutionaries in this in practical terms? These are the question I am constantly asking for myself... Do you have any idea? Why not instead we discuss on how the workers' assembly in Tekel and the other workers could participate in answering the questions you raise to yourself and to the revolutionaries intervening in the struggle? If we trust the that the workers could raise their own consciousness through their own struggle, then they can answer the questions you raise, at least. Maybe I'm wrong, but the soviets in 1905 in Russia and even the mass strikes did not come from the "brilliant" minds of the Bolshevik Party or from the communist organizations, but from the workers themselves. Sometimes, we, communists, are tempted to think that we know everything. Don't worry comrade, there are others like you there. Both committees were made up only and exclusively of the workers. There has been two attempts to form a strike committee although these attempts both failed and couldn't become permanent due to the strike committees being built around more specific issues from what I understand. Thus neither of the committees made any declarations at all, and their practice has been limited to negotiating with the union. This being said, there is an informal but regular "strike committee", just like the informal but regular mass assembly, a network of militant workers from all cities, known by the workers both in cities they came from and others, constantly moving from tent to tent and appreciated for their militancy and stance against the trade-unionists. I'd say that the efforts to form actual, formal strike committees were based on this existing dynamic. But on a more general point: having read your translation of the comrades' first leaflet, there is not so much in it about the mass strike except to see what's going on in Turkey as a germ of a future mass strike. As I understand it, you were criticising the leaflet (or its title perhaps) for advocating 'mass strike' instead of the more realistic 'extension of the struggle'. But as far as I can see the leaflet is talking precisely about the extension of the struggle rather than abstractly calling for a mass strike now. But it may be that I have not understood your criticism very well. I don't have anything to add to what Alf is saying here, basically. 3- You are talking about how the workers are aware of other struggles. But are they also aware of other small strikes in the west -apart from fireman and sugar workers strikes? I think so, I heard a speaker talk about lots of different struggles going on at the same time. I was recently thinking about -this is just an idea- an internet forum or a paper kind of a thing that would eneable discussion between all the striking and struggling workers. Do you think such a thing would be possible? I am not sure, really. Not that many Tekel workers use the internet (I have met some who do, but not many), and haven't put out things like leaflets to distribute among themselves (although they did give out leaflets in some working class neighborhoods in Ankara). I'd say that the efforts to form actual, formal strike committees were based on this existing dynamic. so there is such an effort? Hmm so what do they think about how to develop solidarity? Is there varying opinions? Finally the 26th seems to be a crucial date for the future of the strike. Unions declared that if the government wont step back they will initiate a general strike. What do you think about that? Also what does workers think? What do they think about the possibilities? looks like the unions agreed to initiate a general strike 3 February, which has forced the government back to the table. Is this accurate? what is the score with this at the moment then? What happened with the general strike? Was it well supported? government says they will attack by the end of the month. there will be a new mass demonstration on the 25th i think. What happened with the general strike? it wasn't really a general strike, it seems to have caused more demoralization than anything else. all the union confederations, whether openly or not, scabbed in one way or the other. any more detail on that? has there been a general strike in Turkey before in recent history? Was this different in any way? has there been a general strike in Turkey before in recent history? Was this different in any way? There has been similar one day strikes, probably even with more participation recently. Earlier, there has been events resembling a mass strike, but not an official and actually general general strike. Today the head of Tek-Gıda-İş (The union of tobacco workers) which is attached to Türk-İş Unions Confederation had resigned from the union. He resigned after workers demanded him to declare what has been talked among the union confederation leaders and why these were secretly organised. The guy was also in conflict with the Türk-İş leadership and the only person that was recognized by the workers in Turk-İş bureaucracy. Mikail, do you think there were significant, (semi-)permanent gains made through this action (i.e. developing bonds and consciousness)? I think the action itself was a signifcant source of lessons. It both gave signs of how the working class struggle can be expanded in its contemporary situation and what can be the limitations over it. I believe any discussion&analysis of that would be an important contribution to consciousness. "and can anybody tell me more about how do people respond on those Nationalist movement party and Republican people party... i mean, was there some conflict between these parties and workers? Do they try to use this situation for their interests, and if, how do workers react? Yes, I know, there is some mention about this in article, but it doesnt seem like real conflict, only like people know what these parties are really about and (maybe) are prepared..."